Goalkeeper Artur Krysiak is one of seven players released by Exeter City. The 24-year-old Polish keeper joined on a free transfer from Birmingham City in May 2010 and played 142 times for City. Forwards John O'Flynn, Sam Parkin, Alan Gow and Elliott Chamberlain are also let go, along with midfielder Jacob Jagger-Cane and defender Jacob Wannell. Exeter boss Paul Tisdale is still in talks with wingers Aaron Davies and Jake Gosling, while he has made offers to six first-team players. Experienced midfielders Matt Gill and Matt Oakley have been offered terms, as has Eliot Richards, who was on loan at Exeter since January and has been released by Bristol Rovers. 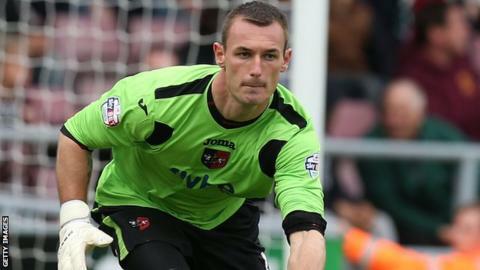 Also offered deals are goalkeepers Christy Pym and James Hamon, as well as attacker Jimmy Keohane. Krysiak was an ever-present in the Exeter side until the beginning of April, when youngster Christy Pym, 19, took command of the number one spot. Parkin O'Flynn leaves the club four years after signing from Barnet and Gow is released having in January. "We've got some changes this summer and we have to spend our money wisely and don't overspend it," Tisdale told BBC Sport. "It comes down to value for money, it comes down to performance and it comes down to potential performance." Tisdale says he will focus on bringing some of the crop of young players through at the club, many of whom have made an impact on the first team this season. "The whole point of the last six months is we've established into the team the likes of Matt Grimes, David Wheeler, Tom Nicholls, Jordan Moore-Taylor and Christy Pym. "There's a number of players now who are established as first-team players, so the benefit of what we've been through, albeit a risky business, was to give those players well over 100 games between them. "We have to think very long and hard about the squad we put together, we rarely have an opportunity to refresh things during the season so we have to put a lot of thought into the season ahead and the potential for development and progression."